Disruption threatens every company. How do you deal with that? Your company faces one choice in a winner-take-all Digital Economy: Get Future Ready now. Win or die. 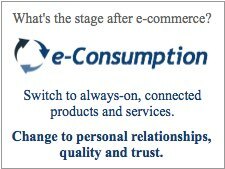 Either your company changes the paradigm to a people-first Digital Economy, or giant digital platforms will attempt to consume your business. When publishing was rocked by Google and Facebook, Amazon’s Jeff Bezos ate The Washington Post. We have entered history’s inflection point. Every company will be eclipsed by the fast-arriving Digital Transformation. But your company can take back leadership with new Expandiverse Technology. Lead the tech-based journey to a people-first Digital Earth. It’s the best way for you and everyone to win. See skimmable key points: Get Future Ready now. 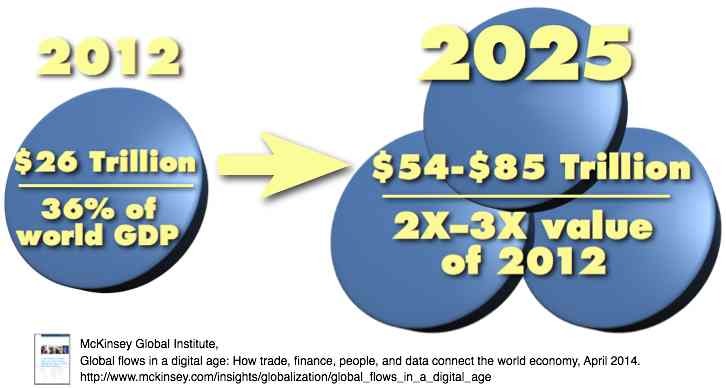 When Digital Convergence begins about 2020 through 2025, only a few companies will be left at the top. Now is the time for your company to start getting Future Ready. Here are briefings and examples to help your company decide to lead — before you’re left behind. An Expandiverse Digital Earth will help everyone leap ahead every minute as we live, work and are entertained. It is human exponential growth for everyone connected, everywhere. If you’re new to these ideas, start with the vision keynote speech on the right: See our coming Crises, and how they will drive our rise to greatness. If you’re a C-level executive at a company that is turning digital, start with the briefing on the left: See the silver bullet innovation you can use to achieve Industry and World Leadership. Which innovation will move your markets and put your company in the lead? This business briefing is based on Dan Abelow’s keynote speech that opened The Conference Board’s Enterprise Digital Transformation Council in New York. How will your company connect with customers, suppliers, employees and partners? The big surprise is the speed and scale at which your company can disrupt your Industry, and drive Global Digital Transformation — not just do your company’s transformation. Here’s the new technology and clear vision you need to start leading tomorrow’s Digital Earth in years, not decades. 9:26 How does this work? Enjoy Dan Abelow’s visionary keynote to a conference in Brazil. This opens with the journey from our pre-historic ancestors to humanity’s rise to prosperity during the Industrial Revolution. 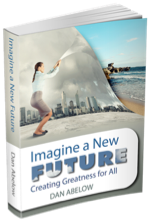 This is now producing a “Crisis of Success” as we become unquenchable. Countless billions want unlimited consumption for centuries to come, threatening the Earth. Our Crisis of Success will force us on a Journey to Greatness. We no longer have a choice: We must build a Digital Earth with superior personal and global abilities. How will this amazing future begin? What will its technology be? How will we live and work? Instead of questions, here is where you see how our generation will become one of the most important in history, as we turn toward a predestined Journey to Greatness. It’s begun: An economic extinction of companies and jobs. Every two weeks, on average, a company falls off the S&P 500. By 2025, half of today’s leading companies will be new. How will your company survive and prosper? This strategy is how to survive and get the resources to become a digital leader. Expandiverse Technology adds a digital disruption initiative next to your main business. 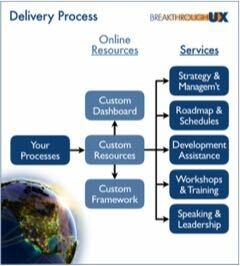 This starts small and lean, focused on developing your industry-leading platform. 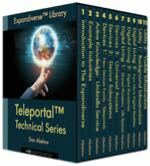 Using new Expandiverse Technology, it shows you how to capture leadership in your industry. Your new platform will help your company and customers rise to the top, with you as a digital leader of your industry. Then your platform will scale to more industries — with your company as a leader of our new Digital Earth. Win-win: Companies and customers develop the always on, two-way relationships that builds the worlds everyone wants. Win for people: Each person chooses and enjoys new journeys to quality living — supported by Active Knowledge, Resources and Commerce. Gain elites’ power. 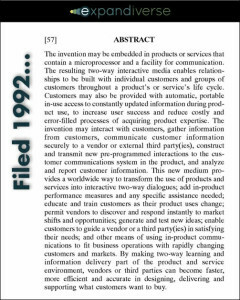 Win for companies: Continuously connected consumers’ needs are visible and known. Replace advertising costs. Deliver journeys to quality living consumers choose. People live the lives they choose through always-on partnerships with customer-focused companies. The economy builds the world people choose. How is this new “visible hand of the market” created? People have always controlled what they look at. Next, Digital Boundaries will automate your control over what you display on your screens, and what you keep off of them. The world’s most valuable real estate will become your user-controlled interface on all your screens. First, consumers will display the worlds each of them wants, the worlds they believe in. 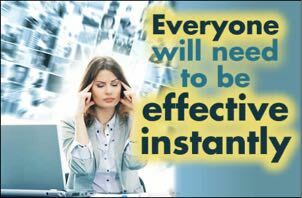 Second, consumers replace today’s targeted advertising tsunami with the ads and content that each person chooses. Third, when consumers control their screens, they help shape tomorrow’s Digital Economy and the worlds it builds. Your results from your Digital Boundaries? Companies will serve you. They will make your life — and your worlds — better. They will know your needs and fit your choices, instead of trying to make you serve them. People already use ad blocking to stop ads from appearing on their screens. When Expandiverse Digital Boundaries let you choose which ads and content you display, the world you see will be the world you believe in. This strengthens the companies and values you want, and diminishes the companies you banish. People changed entire industries when they took control of music and news. Next, you can help transform unhealthy food (obesity and disease) and damaging fuels (global warming from carbon-based energy). Expandiverse Digital Boundaries are a kill switch on the world you don’t want, and a green light for the world you want to help develop. Digital Boundaries can be run automatically for millions by advertising services. They can also be managed by nonprofits whose goals people want to strengthen by guiding the economy in those directions. This also earns nonprofits income by sharing the advertising revenues from managing consumers’ interfaces. Responsive companies will connect directly to you and deliver the “high quality experiences” you choose. When consumers display the worlds they believe in, their choices will change the world. You’ve used platforms for years. Now, a new kind of Expandiverse platform can provide a continuously connected global supply chain. This will produce the real-time global economy that we will need in our huge and fast-growing world. On the supply side a company can continuously connect manufacturing, shipping and distribution to get the right products to the right sellers when their customers need them. On the demand side, customers can be continuously connected so their needs are known and met right away. As we grow a global supply chain that’s 2 to 3 times larger, we will solve supply chain problems immediately, and reach new levels of economic performance. 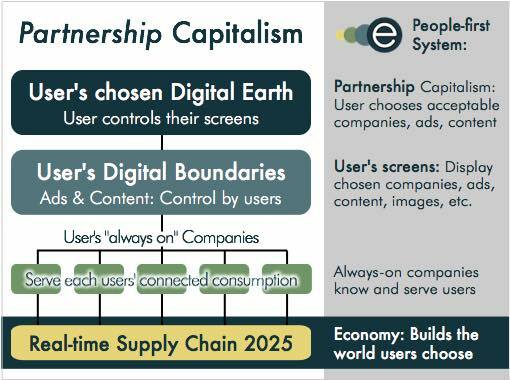 On a Digital Earth, everyone in a global supply chain will experience it in a new way. All the parts of a supply chain will enjoy continuous connections in Expandiverse Shared Spaces. As each participant does each step, supply chain managers can evaluate the progress. They can coordinate in real time with each participant, and with those who receive what they do. With new continuous connections in always on Shared Spaces, global supply chains will become more accurate and effective. During the next decade, companies will spend over $1 trillion on their Digital Transformations. 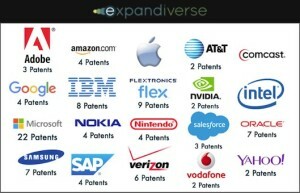 Expandiverse Technology adds a roadmap for your company to lead your Industry, then help lead the World. 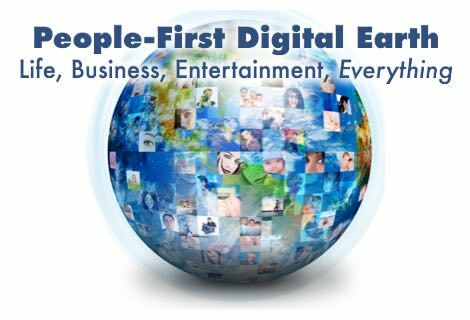 The Expandiverse is designed to start universal success on a people-first Digital Earth. Everyone can rise to the top, everywhere — with a timeline that starts in years and builds out in 1-2 decades. This was created to take advantage of this unique inflection point. Can our generation build history’s first successful planet? When technology turns the physical world digital, this change will be big and fast. Up to 40%–50% of companies and 47% of jobs will be obsolete. If you can’t race faster than this bullet, this shift could kill your company — and your personal future. A digital economy is winner-take-all, and today’s leading digital companies aim to win. Your company will work for them or they will shut you out, and maybe shut you down. But your senior executives don’t want you to disrupt your existing businesses. They want to keep doing what worked last year. Just make that more digital and faster. Today’s Status Quo: A few digital companies are leaders. 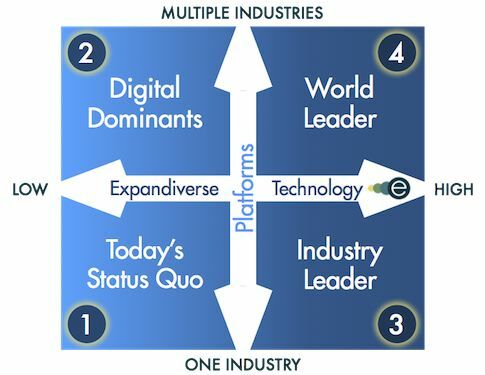 Digital Dominants: Leading platforms capture your industry. Industry Leader: With an Expandiverse platform you can lead your industry. World Leader: With a multi-industry Expandiverse platform, you can become a world leader. How will your company remain a leader in 2020? In 2025? New Expandiverse Technology and services give you three direct steps: First, we start you fast with your company’s custom foresight, delivered as a private speech to your senior executives. Then we help you design and develop your company’s Digital Transformation. Third, we expand your abilities to lead your industry and the world. Forecast future technology? Been there, done that with steps into today’s 1-to-1 interactive products and services. 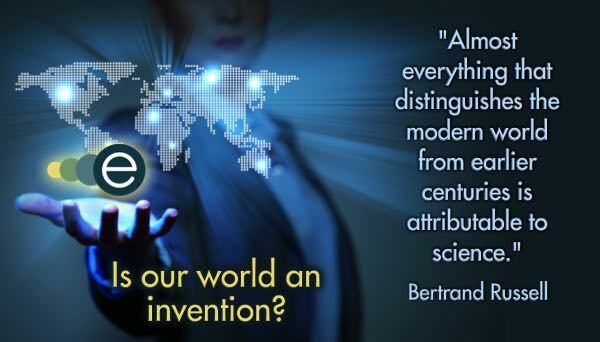 Patented tech cited over 700 times and licensed by more than 200 companies. 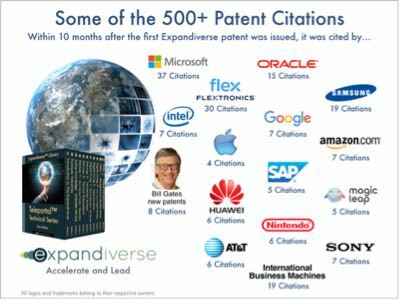 Research: What is the value and importance of over 500 early patent citations for Expandiverse Technology?